In the 2013 election, I took some interest in the election result in Indi, a seat located in the north-east of Victoria. My interest was spurred by the chance that Sophie Mirabella, who was flagged to be the next Science Minister if the Liberal-National coalition won government, might be usurped by Cathy McGowan, an independent candidate. Also, I have some relatives in that part of the world, so I was interested to know who would be their local representative in what turned out to be a very close election. I enjoyed trying to predict the outcome of the election in Indi, as counting continued over a matter of days. You can see an account of my efforts here. (As an aside, this is the most-read post on my blog – I have an alternative career option should I give up ecology!). In predicting the winner of the election, there are two main unknowns that need to be determined – how the preferences are flowing to the two leading candidates, and whether the swing in votes is sufficient to usurp the sitting member. Australia uses a preferential voting system. Voters select their preferred candidate in the seat for the House of Representatives, then their second preference, third preference, etc, until the voter has indicated their preferences for all candidates in the seat. The initial counting of votes tallies these first preferences for each candidate. Then, the ballot papers of the candidate with the fewest votes are distributed to the other candidates based on the second preferences on those ballot papers. So if we had five candidates initially, the possible winners are narrowed down to four, and the ballot papers of the fifth candidate are then allocated to the remaining four candidates based on the second preferences. Then, the ballot papers of the candidate with the fewest votes are distributed among the other three. This process continues until we have only two candidates remaining, at which point we have the two-candidate-preferred vote. After this point, the candidate with the most votes wins. In trying to predict the winner of an election, a key part is predicting how the preferences will flow to the two leading candidates. The Australian Electoral Commission provides updates on first preference counts initially, and then two-candidate-preferred counts as they are completed. Because the two-candidate-preferred counts lag behind the first preference counts, it would be useful to predict preference flows. If preferences have been counted for a sample of booths, it is possible to model the flow of preferences – here is one way to do that. We can see that in the Alexandra booth, Cathy McGowan only won 216 first preference votes, compared to Sophie Mirabella’s 715. But the 448 votes of remaining candidates flowed distinctly towards McGowan – on more than 78% of those ballot papers, McGowan was preferenced ahead of Mirabella, so she collected those preferences. The flow of preferences was even stronger in Beechworth, where McGowan won almost 88% of the distributed preferences, but she got less than 52% of the preferences in Baddaginnie. You might notice a big difference between Beechworth and Baddaginnie in the first preferences. For example, the Greens won almost 7% of first preferences in Beechworth but less than 2% of first preferences in Baddaginnie. We can model this flow of preferences as a function of the first preferences to predict the two-candidate-preferred vote from first preferences. Here, we are essentially aiming to predict the fraction of votes that flow from the first preferences of the other candidates to the two leading candidates. We can build this model using linear regression, but we would like to constrain the model coefficients such that they are between zero and one; the coefficients estimate the proportion of voters whose preferenced one of the 2CP candidates ahead of the other. 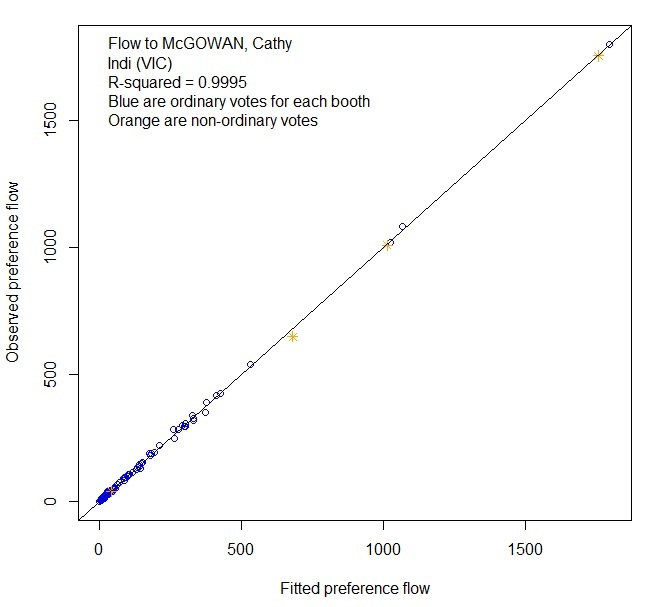 Observed preference flows to Cathy McGowan versus fitted preference flows for each of the booths (and the non-ordinary votes) based on the 2013 federal election results. These coefficients estimate that McGowan was preferenced behind Mirabella by almost all voters who put Hayes first (the estimated coefficient is zero), but she was placed ahead of Mirabella by almost everyone who put Walsh first (the estimated coefficient is 0.992). Observed preference flows to Alexandra Bhathal (a Greens candidate) versus fitted preference flows for each of the booths in the seat of Batman (and the non-ordinary votes) based on the 2013 federal election results. 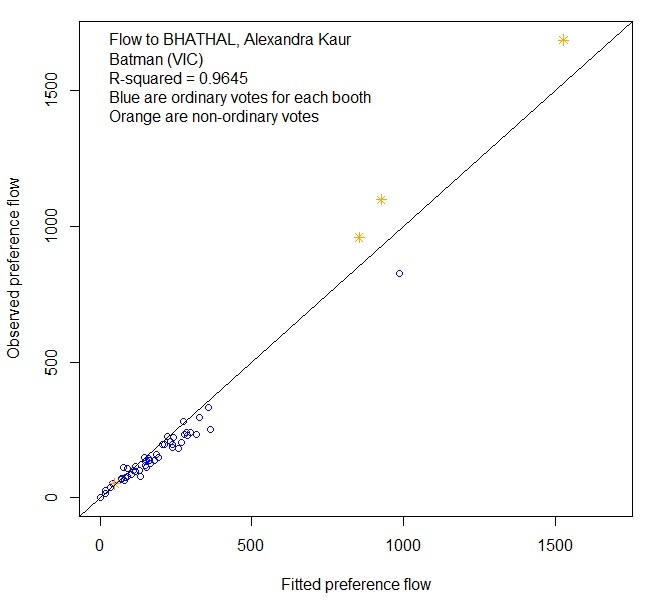 The model for Batman doesn’t work quite as well, largely because Bhathal received a greater flow of preferences from the non-ordinary votes (orange symbols in the figure) than from the ordinary votes. These non-ordinary votes are the postal votes (Bhathal received almost 1700 of the flowing preferences), absent votes (Bhathal received over 1000 of the flowing preferences), early votes (Bhathal received just under 1000 of the flowing preferences), and provisional votes (there were very few of these). Interestingly, a similar pattern occurred in Wills, which is another inner Melbourne seat with a Greens candidate – it seems the Greens garnered strong preference flows from the non-ordinary votes in 2013. Whether that will be borne out in 2016 remains to be seen, but strong preference flows will be needed by the Greens if they are to prevail in Batman. If you’d like to look at preference flows for yourself for different seats in the 2013 election, then you are welcome to use my R code that I wrote – it scrapes the data from the AEC website, runs the model and prints out the result. The code is best run using the source command in R so that you are prompted to select the seat from the list of lower house seats (or you can just specify the seat number directly from within the code). And please excuse my R coding – I know it is clumsy in places, I am learning, and am yet to figure out R’s data structures properly to do vectorized operations (among other things I don’t understand). Also, I haven’t checked that this works on all seats – there might be some anomalies that I haven’t accounted for. formula <- "nflowed ~ a*otherfirst[, 1]"
Well, I hope you found that interesting. We’ll see what happens in the 2016 election… I might do something about swings in a second post if I have time. Attempts to identify invasive species have usually compared their traits to those of non-invasive species. Yet invasive species are classified using all sorts of criteria. Firstly, they might be exotic species that reach high abundance when present in an area. Or they might be species that have wide geographic ranges (because the environment in which they occur is common), or have wide environmental tolerances. Or they might be species that spread rapidly. Or they might be species with various combinations of these criteria. Are orange hawkweeds regarded as being invasive because they spread quickly, potentially reach high local abundance, have broad environmental tolerances, or because they might spread across large geographic areas? Or is it some combination of these? Attempts to identify the traits that make species “invasive” should work better by examining these biological dimensions separately. If we just think of these four criteria, then a species might have any one of 16 possible combinations. And only one of these sets of criteria would represent a species that would categorically be “non-invasive”. So we might have (at least) 15 forms of invasiveness (24 −1 = 15). And if you add a fifth category (e.g., species having adverse impact), then we would end up with 31 possible forms of invasiveness (25 −1 = 31). The 15 possible forms of invasive species (and the one form of non-invasives species). The size of the pie slice identifies the proportion of studies that classified invasive species by these criteria (from Catford et al., 2016). Our paper examines the literature (112 papers) to determine how many of these forms of invasiveness have been used to classify invasive species. What do you know? All 15 forms of invasiveness appear in the literature. This wide range of ways in which invasive species are classified will obscure efforts to identify a consistent set of traits of “invasive species”. Because traits that imbue species with broad environmental tolerances, for example, will be different from those that permit high rates of spread. Examining traits linked with the four demographic dimensions of invasiveness (rather than “invasiveness” per se) should help highlight species at risk of becoming dominant, spreading quickly or occupying large ranges. That seems like a more fruitful way to identify invasive species because the meaning of “invasiveness” is defined more clearly. Detecting a species from the DNA it left behind seems so much like CSI: Ecology. DNA deposited in the environment (eDNA for the cool kids), which can then be collected and identified, is increasingly advocated for ecological studies (Ficetola et al. 2008; Bohmann et al. 2014). Adam Smart: doing a bit of sampling. Detection rates from eDNA sampling are often much higher than more traditional survey methods, which is a potentially large advantage. For example, Adam Smart, a recently-completed MSc student in QAECO with Reid Tingley as his lead supervisor, showed that invasive newts in Melbourne were detected much more frequently in a single water sample compared to a bottle trap (Smart et al. 2015). While eDNA sampling can have higher detection rates than more traditional methods, it can also be more expensive. How do we determine whether eDNA sampling is cost-effective? This is the question Adam set out to answer with a second paper from his MSc, which has just been posted online (Smart et al. in press). Adam compiled various cost data for bottle trapping and eDNA surveys. These costs included materials, travel to sites, time spent at sites, generating primers for the DNA analyses, and conducting the lab-based DNA analyses. He optimised the detection efficiency of each of the two survey methods, using our method to optimise allocation of effort among visits and effort per visit (Moore et al. 2014, but also see the latest in Moore and McCarthy in press, about which I am quite excited). He then compared the performance of the two methods as a function of different total search budgets. Probability of detection of newts at a site in Melbourne as a function of total budget for one of the scenarios examined in Smart et al. (in press). Results are shown for high cost and low cost eDNA scenarios, and for a standard bottle trapping scenario. It turns out that for the cases we examined, eDNA sampling and the bottle sampling had similar detection efficiencies when accounting for costs. The choice of the best method depended on the cost structures, but regardless, the efficiencies were quite similar. While the two methods were similar, the cost efficiency of eDNA sampling should improve. Firstly, eDNA costs will decline over time, while the costs of traditional sampling methods are unlikely to decrease if person hours represent the main expense. Secondly, eDNA promises to detect many species simultaneously, especially for species that might be otherwise hard to detect (Bohmann et al. 2014). Thirdly, eDNA sampling avoids some of the ethical concerns arising from the effects of trapping animals. Of course, eDNA sampling has some drawbacks. The actual source of the DNA cannot be guaranteed. Could it have arrived on the feet of ducks? Might it have arisen from contamination? Procedures exist to reduce contamination. However, DNA evidence can be nullified in law courts, so it will not be 100% reliable in ecology. Further, physical specimens might be required, in which case eDNA will not be sufficient. However, it seems that eDNA is only set to become more prevalent. We are continuing to work on improving and evaluating eDNA sampling via an ARC Linkage Grant – CSI: Ecology here we come! Read Adam’s paper in Methods in Ecology and Evolution, or access the submitted version here. Prime Minister Malcolm Turnbull delivering his speech that received a standing ovation from (most of) the audience. Even my hair was getting right into it. He had just about everyone on their feet. The mood at the Prime Minister’s Prizes for Science was upbeat. We’d been treated to a stellar array of talent – science that could clearly lead to economic windfalls, science to help manage the country and its natural environment better, and outstanding teachers to help foster a more scientifically-literate community. Malcolm Turnbull, the newly appointed Prime Minister, received a standing ovation for his speech that emphasized science as underpinning both the current and future prosperity of Australia. Standing ovations are a rare accolade from a scientific audience; rarer still when directed toward a politician, especially one from a party that had disparaged and cut funding to science so very recently. The mood was buoyant, as we celebrated science and great scientists such as QAECO’s own Dr Jane Elith. That was six months ago. And not everyone had stood to applaud. Some wanted more tangible proof that science really was going to be placed at the heart of Australia’s prosperity. But even as I stood, I wondered two things. Could the Prime Minister sway his cabinet to follow his call? And for all the talk about science and innovation, what would it mean for funding? Perhaps more importantly, what would it mean for planning and better integration of research and higher education? Six months would be telling. In particular, what would the Turnbull government’s first budget reveal? I was prepared to wait. For too long now, funding of universities and major research institutes such as CSIRO has been distributed without a coherent plan for research and researchers. We can’t simply turn funding on and off like a tap and see changes in research performance. The human capital employed by that funding doesn’t change that quickly. It takes months, even years, of lost productivity to shift one’s research environment. Training and establishing a research career can take a decade or more. We can’t have a research fellowship scheme that sees 200 fellowships one year, but only 50 in another. Or a fellowship scheme that is an expendable hostage in a game of political brinkmanship. Perhaps more importantly than the number of fellowships, we need capacity within our research institutions to accommodate that talent in the longer term. There is little point investing in fellowships if those recipients have limited opportunities once their fellowships expire. If we want people to continue on research careers, they need to be able to see pathways. The instability and lack of planning means pathways are obscure for many young researchers. At the moment, they are living on hope, on skepticism, or on disappointment. And we’re living on a slogan. The Ideas Boom. Let me tell you – there won’t be an Ideas Boom in Australia without a properly funded plan. Up until now, the Ideas Boom was simply a $28M advertising campaign. It still is. The Ideas Boom will happen elsewhere, and some of Australia’s most innovative scientists will move there. Why? Because the budget does very little to lay the foundation for any coherent plan for science and innovation in Australia. In fact, the budget entrenches the Abbott government’s 20% funding cut to universities without providing further capacity to increase income. Government expenditure on research is going south. As a proportion of each country’s GDP, Australia spends less than half of the research expenditure of Iceland, Finland and Denmark. If this were an Olympic medal tally, the public would demand an inquiry – we’re being beaten by New Zealand! If we want an Ideas Boom, we’ll need more and smarter investment. Government spending on R&D for major advanced economies. Sourced from the ABC FactCheck. University income has been increasingly derived from sources other than the Federal government for several years now. Below are the values reported by The University of Melbourne – the majority of its funding will soon be from private sources, it seems, given further cuts to university funding. Other Australian universities are likely on a similar trend. The University of Melbourne has increasingly sourced its income from private sources, particularly fees. With further funding cuts entrenched, that trend will continue. The budget plugs some holes in research funding. Notably, various specialized pieces of infrastructure will be funded, supporting a small fraction of Australia’s research capacity. And extra funding for GeoSciences Australia will help us find more resources to mine. Antarctic science is set to benefit from an expanded Antarctic program, including a new boat just over the horizon. But the announced support is haphazard against a background of cuts. This is not an Ideas Boom. It’s business as usual – reduced funding across the board, and sprinkles of funding in pockets. The standing ovation is over. Everyone has resumed their seats, with arms folded. The Ideas Boom is busted. Well, to be honest it can’t really be busted because it was never built. In one of my subjects, I used data on the relationship between the global temperature and CO2 concentrations to teach how variability can mask relationships, making inference uncertain. The example was based on an Australian political debate in 2009 about whether the temperature of the Earth had stopped increasing despite an increase in atmospheric CO2. With an Australian election looming in 2016, it seems timely to return to that debate, and evaluate the positions of the different protagonists now that we have some more data. It is nice to hold our politicians to account. Let’s first look at the data. I will use the latest HadCRUT4 data for global surface temperature, and the average annual CO2 concentration data measured at Mauna Loa (both downloaded on 20 April 2016). We have the CO2 data from 1959 to 2015, so I will use that period. You can see that the CO2 concentration has continued to increase since 2008, largely unabated it would seem. Atmospheric CO2 concentration as measured at Mauna Loa by NOAA. Data from 2009 onwards, available after the Senators’ debate, are shown in blue. Temperature increases have been noticeably more variable, although that variation is consistent with annual variations of the past. The HadCRUT4 measures of the global annual surface temperature anomaly, as measured by the Hadley Centre and the Climatic Research Unit. Senator Wong believed that the Earth’s temperature would continue to increase in line with increases in CO2 concentrations. We can characterize that by a regression model that has a linear relationship with atmospheric CO2 over the entire time period. Of course, Senator Wong’s position was not just influenced by the data, but also by the overwhelming majority of climate scientists who agreed with her position given their understanding the Earth’s climate system. Nevertheless, we will ignore that extra information here. We can estimate the best fitting line for such a relationship, and predict the uncertainty around it – this uncertainty represents the range of predicted variation given that the recorded temperature at the Earth’s surface only approximates the heat content of the world. In the graphs I show here, the uncertainty bounds are 95% prediction intervals – we expect 95% of the observations to fall within the bound represented by the dashed lines. Subsequently, we can determine how well that relationship fits the data that have been collected from 2009 onwards. With the CO2 concentration increasing, the Earth’s temperature has continued to increase. However, that increase has been somewhat below the average trend, with the notable exception of the data in 2015, which has exhibited a large spike. Relationship between the global temperature anomaly and CO2 concentration measured at Mauna Loa. The solid line is a linear regression, and the dashed lines are the 95% prediction interval. The regression was estimated on data up until 2008 (black dots), and the predictions are compared to data for 2009-2015 (blue dots). However, we can say that Senator Wong’s position is largely consistent with the data collected after 2009; her predictions fall within the uncertainty bounds. Also, it is worth noting that the large spike in temperature in 2015 might well have been larger given the magnitude of increase in the CO2 concentration. Senator Fielding believed that the Earth’s temperature had stopped increasing after 1998. We can characterize that by a regression model that has a linear relationship with atmospheric CO2 up until 1998, and then a flat line after that period. Again, we can estimate the best fitting model for such a relationship, characterize the uncertainty around the predictions, and compare those predictions to the data collected from 2009 onwards. Relationship between the global temperature anomaly and CO2 concentrations measured at Mauna Loa. The solid line is a piecewise linear regression that fits a sloped line to data up until 1998, and then a flat line from 1999 to 2008. Data for 1998 were removed to reduce the influence of cherry picking. The regression was estimated for data up until 2008 (black dots), and the predictions are compared to data for 2009-2015 (blue dots). Senator Fielding’s position was also largely in line with the data up until 2014. While the model characterizing Senator Wong’s position was a touch on the high side of the data, the model characterizing Senator Fielding’s position notably under-predicted the temperature. And Senator Fielding’s model severely under-predicts the temperature of 2015 – the temperature spike of 2015 is well outside the expected bounds, even when considering the variation in the data. So, here we are 7 years and several governments after this political debate. The data support Senator Wong’s position, and are now contradicting Senator Fielding’s position; the temperature continues to increase. Note, the average temperature anomaly for 2016 so far is 0.979 C (based only on 2 months of HadCRUT4 data, so this is an uncertain estimate of the entirety of 2016). If that anomaly holds, we can conclude that Senator Fielding was sorely wrong, and even the model characterizing Senator Wong’s position might under-predict the temperate increase. Seeing how atmospheric CO2 concentrations continue to increase, with concomitant increases in the heat content of the Earth, I can only conclude that the global community really should be acting much more rapidly. And I would hope that Australia would take the lead with this. I wonder the extent to which this will feature in the election campaign.